Being hard pressed, I’d have to admit that my interest in shooting originated from the pages of “Boy’s Life.” My Dad, a WWII vet was the Scout Master and I was a fervent Cub Scout. Along with that came a subscription to “Boy’s Life.” I’d wait anxiously every month for the magazine to arrive, and the first thing I’d do would be to page through and find the rifle ads. I’d plan my safaris, or trips to foreign battle grounds, spending countless hours mulling over which bolt action, pump, or over under 22/410, would best suit my expedition. Needless to say of course, none of the adventures actually occurred, and I didn’t get my own real firearm for at least another decade, but I was none the less hopelessly hooked! 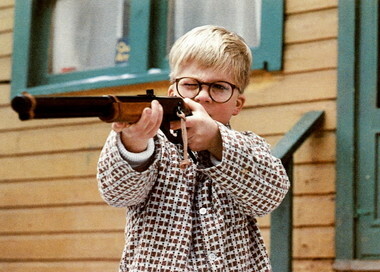 Ralphie tries out his Red Ryder BB Gun, shortly before he nearly “shoots his eye out.” My Choice was a Golden Eagle model. Maybe a summer or so later I mentioned to the family in a very “Christmas Story” kind of way that I’d like to get a BB gun. Well I went out and sold greeting cards door to door for the Junior Sales Club of America and a few weeks later I was the proud owner of a Daisy Model 98 Golden Eagle, complete with a 2 power scope and the Daisy Pledge embossed into the seal on the stock! The Boy’s Life ad for the Junior Sales Club of America. The Yellow arrows indicate some of the items I earned by selling greeting cards including the Eagle BB Gun, a Real bugle, and a Flying Tigers .049 U-Control plane. “I pledge to protect people, property, and animals in my community by aiming and shooting my Daisy safely.” I imagined that I was that kid in the seal, standing on that rock holding my precious Daisy safely. You know what, I actually took it seriously! The Daisy Pledge which was embossed into the stock, genuine plastic no less, of the Daisy Golden Eagle BB Gun, The inset is the Golden Eagle in the JSCA Ad. Time went on and I graduated to a Crossman 22 pellet gun, which I still have, and from there I went on to the NRA’s Junior Marksmanship program, progressing through the ranks from Pro Marksman, right on up to Sharpshooter with a couple of bars. And I did it shooting in the BASEMENT RANGE in Plaza Elementary School. A range built by the Army Marksmanship unit under the authority of the Director of Civilian Marksmanship, the O.D.C.M. The same outfit that provided the free ammunition we practiced with. The yearbook coverage of the BHS 1965 Smallbore Team. Their third consecutive year as Division Champs. Nobody questioned the legitimacy of the sport, well almost anyway. The mission of the O.D.C.M. at that point was focused on the promotion of Safety and Marksmanship in the shooting sports, with a minor in actually selling MILITARY surplus arms and ammunition to the civilian population. And yes, even then, there was the element of protecting gun rights, but that was just part of it. Mostly it was about the O.D.C.M. and the N.R.A. figuring out how to most effectively facilitate Rifle and Pistol Practice. Somehow it seemed that all of the G.I. Dads, who had spent time protecting our freedoms, somehow “got it,” and there wasn’t a whole lot of discussion regarding the defense, of the Liberties that they had fought for, domestically. My point is that NOBODY thought that shooting, and BB Guns and School basement ranges were weird or dangerous! Well, almost nobody! But times, “they were a changin’!” Along came the Kennedy Assassinations which effectively shut down the mail order rifle business giving the anti gunners their first real win, the Gun Control Act of 1968. The shooting sports still enjoyed free smallbore and centerfire ammunition through DCM affiliated clubs, as long as the clubs supported Junior Shooting Programs and you could still get surplus arms for a hundred dollars or less. Many of the various high schools on Long Island were still fielding smallbore shooting teams, but the numbers were dwindling. Join the NRA today and help the fight to save our Second Amendment Rights! Click the link and save $10 on the Price of your membership. Remember that range I shot at in the elementary school? Well, it was closed down for “safety reasons.” OK, it might actually have been poorly ventilated, but no one who ever shot there had any issues with lead contamination or toxicity. None the less, that’s precisely how an anti gun doctor in town managed to get it shut down. He found concentrated lead deposits on the pockets of the shooting jackets, precisely where our coach had us wipe off any dropped rounds prior to chambering them. Well that ended that, the range was shuttered forever! Off I went to serve my country during a singularly unpopular war. I maxed out every shooting qualification during training basically because the O.D.C.M. had fulfilled it’s mission. Fortunately my MOS took me to Germany, where I am under obligation not to discuss what I did. Eventually I came home to a world that had changed. Not only were men in uniform baby killers, but anything to do with war and and particularly war’s toys were evil. It didn’t matter who was holding a gun or why. The anti’s were really gaining ground and momentum. That was around 1972. A few years later I was running the junior shooting program for my club and shooting the National Match Course with my DCM M1 Garand. When along came the Gun Control Act of 1994. What was going to happen to my precious “Military Style” fire arms with the evil bayonet lugs? The assault on Second Amendment Rights was well on its way. Some Long Island high schools moved to air rifles for their shooting teams, but many opted out of fielding rifle teams altogether. There are still a few High School shooting programs virtually none of which shoot rim fire any longer, but the future for them here on Long Island is bleak indeed. Boys Life is still published but the firearms ads appear to be a thing of the past, right along with the JSCA. firearm brand name merchandise marketed for children (such as hats, shirts, and stuffed animals). the use of firearm marketing campaigns with the specific intent to appeal to children. A prohibition on the manufacturing of a gun with colors or designs that are specifically designed with the purpose to appeal to children. (A) ‘‘Real gun, not a toy.’’(B) ‘‘Actual firearm the use of which may result in death or serious bodily injury.’’(C) ‘‘Dangerous weapon’’(D) Other similar language determined by 25 the Federal Trade Commission. And I earned my first BB GUN WHILE I LIVED IN ILLINOIS! Remember, I was in the Cub Scouts! How far we have come! Stay Tuned! I still have more to say, but sadly, even I am having a hard time staying awake at this point, but I promise, more to come… Can You Spell NYSAFE Act? This entry was posted in Politics and the Second Amendment and tagged Cub Scout, Golden Eagle, Junior Sales Club of America, Red Ryder BB Gun. Bookmark the permalink.